Blue Grotto is known throughout the world for its intense blue tones of its interior. Visitors can reach it either by bus or taxi from Anacapri or by boat from Marina Grande. This pretty square's original name was "Piazza Umberto I", but from the 1930's it has been known as "La Piazzetta". Now, it is the meeting point for islanders, visitors and villa owners. The National Archaeological Museum of Naples is one of the oldest and largest museums in Europe. It holds masterpieces from Pompeii, Herculaneum and Stabia. This painting comes from the so-called Basilica of Herculaneum and represents the music teacher centaur Chiron and his pupil, the famous greek hero Achilles. Paestum boasts three magnificent Doric temples included the Temple of Neptune, dating back to the fifth century BC. The Church of Gesù Nuovo or of the Trinità Maggiore is a well-known church of Naples and it helps to define Naples the "city of five hundred cupolas". The Cathedral of Amalfi, whose original structure dates back to the ninth century, is the symbol of the ancient maritime republic. The church dominates the square from a high staircase. Typical of Capri are the famous Faraglioni, three small rocky islets (Stella, Middle Faraglione and Scopolo) located at short distance from the shore, creating a show-particular dramatic effect. In 79 A.D. Vesuvius erupted ash and lapilli stones on Pompeii, burying it under tons of pyroclastic material. Two thousand years later, you can admire the remains of that great civilization. Herculaneum was destroyed along with Pompeii in 79 AD by a terrible eruption of Vesuvius. Buried by a torrent of fiery mud that preserved many wooden structures, you can visit that portion of the city brought to light. In the heart of the Cilento Coast Acciaroli rises, a small fishing village. From the sea you can see its Saracen tower of the Anjou and the nearby church of the XII century. 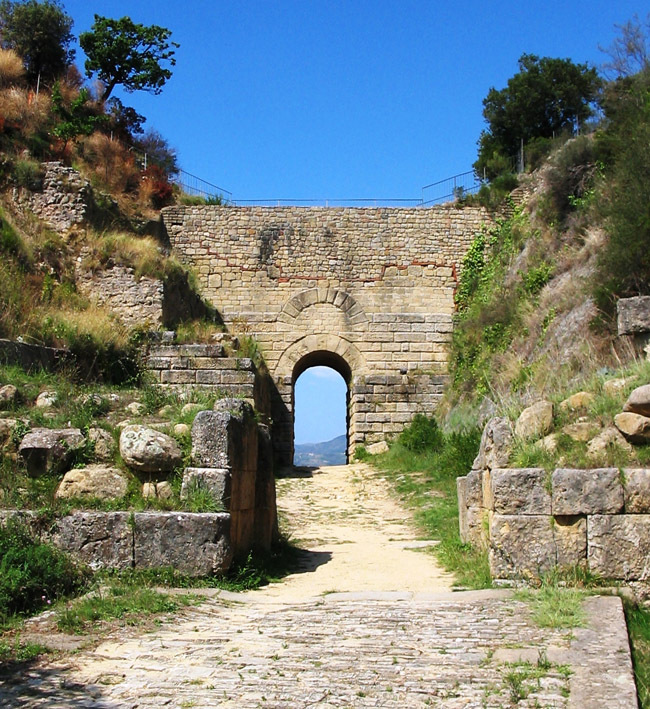 Porta Rosa is a construction dating back to the fourth century B.C., found in the archaeological area of Velia-Elea (Ancient Greece), which is the oldest example of a round arch in Italy. In the undergrounds of the Pozzuoli amphitheater one can still see parts of the gear to lift the cages carrying wild beasts on the arena and probably other parts of the script of the shows. The Arch of Trajan in Benevento is a triumphal arch dedicated to the Emperor Trajan at the opening of the Via Traiana, a variant of the Via Appia, which shortened the journey between Benevento and Brindisi. The Benedictine Basilica of Sant 'Angelo in Formis boasts Byzantine-style frescoes that are among the most important paintings of that time in southern Italy. The church, dedicated to St. Michael the Archangel, is set in a medieval village of Lombard origin, on top of a hill, 401 meters on the slopes of Monti Tifatini. The town is now called Casertavecchia. The painting depicts the Gospel story in which Christ on Mount Tabor reveals his divinity to his disciples Peter, James and John. Infact, the prophets Moses and Elijah are materialized, and so they fulfill the prophecies of the Old Testament. Castellammare di Stabia is situated in a natural amphitheater beside the gulf of Naples at the foot of Mount Faito. It is famous since ancient times for its 28 mineral water springs, all different in composition and healing. Palinuro is a gem set in the beautiful coastal landscape of Cilento: a huge arc of jagged rock which juts into the sea to create a sheltered and natural harbor for sailors. Sapri is on a small coastal plain that slopes gently into the clear waters of the bay front, closed by a semicircle Apennine mountains that rise behind it. Agropoli is the gateway to the Cilento Coast. It stands on a promontory which saw the presence of man since Neolithic times and preserves the old town with the Angevin-Aragonese Castle. Bacoli is in a lovely location, opposite the island of Procida and enclosed between the ridge of the Castle of Baia, the Poggio tip and Lake Miseno. The area is rich in Roman remains, such as villas and temples. Oplontis was a seaside suburb on the slopes of Vesuvius. It later became an appendage of the Roman cities of Pompeii and Nola whose inhabitants made use of its port for trade in the Mediterranean. Camerota, nestled between the promontories of Capo Palinuro and of Infreschi, summarizes the characteristics of many Cilento places built on high ground for defensive purposes, but with an outlet to the sea.